Both Quark and InDesign can import native PSD files. But which one is better at supporting PSD features? 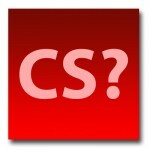 Find out at usingindesign.blogspot.com. Yes, you read that right. This appears in a free PDF on their website, QuarkXPress 8, Xperience Design. So, I thought I’d test the waters and it turns out that the statement is pretty accurate. Quark will effectively flatten the file and you won’t have access to the layers if you include any effects. You can get around this by converting your effects into layers. Quark also recommends converting Shape layers to Smart Objects for maximum compatibility. So what can you do with PSD files, once they are imported into Quark? You can turn layer visibility on and off and change the blending mode and opacity. 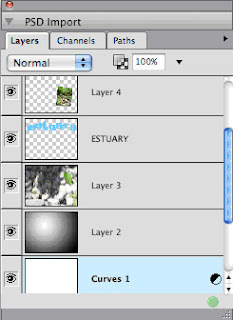 Unfortunately, you can’t change the order of the layers, add layer masks, or effects to them. However, you can view and work with Channels and Paths that are saved in the PSD file. For example, you might have a Spot Color channel in a file. Let’s say that you decide you want to change the spot color. You don’t have to go back to Photoshop to do that, just double click on the Spot Color channel and choose another color in the palette. Any changes you make to the PSD file outside of Quark will be indicated by a Red circle in the lower right-hand corner of the PSD Import palette. You won’t need to go to the Usage dialog to update the file, just double click on the red circle. InDesign has a feature called Object Layer Options for placed PSD files. There’s two things you can do with this, turn layer visibility on and off and choose a Layer Comp, if they are in the file. Here, again, you can’t change the order of the layers but more so, you can’t change the opacity or blending modes on the fly. You can’t get to the Channels or Paths, but InDesign does handle them. In the case of that Spot Channel, the color is added to the Swatches panel and Paths can be used in the Text Wrap panel. So, as you can see, Quark does have a little bit of a leg up here on the PSD thing, with potentially less trips back to Photoshop for edits. Is it a tighter integration than InDesign? Hmmm. What are your thoughts? The End of the Road for Quark? Strange things are going on in the Quark camp. Find out what’s happening. The desktop publishing software wars have been going on for about two decades now and there still isn’t a clear winner. In fact, there are more tools to use now than ever before to get a project printed, including Apple’s Pages, and Corel’s CorelDRAW Graphics Suite. With the addition of multiple artboards, Adobe Illustrator CS4 can now be used the way everyone wanted to use it – for page layout and print jobs. But the two giants in this category are QuarkXPress and InDesign. Quark had a long hold on the industry with little competition for the longest time. So long, in fact, that they didn’t really do a major upgrade from Quark 4 (1997) to 5 (2002) for a period of 6 years. At that time, Apple was transitioning their operating system to the Unix-based OSX and Quark refused to recode their application until Quark 6 came out in 2003. It was during that long stretch that Adobe, who had limited success with PageMaker, decided to scrap the application they bought from Aldus and start all over, inventing the “Quark Killer”, as it was then Called, InDesign. With a list of features that every designer was pining for – transparency, effects, creative suite integration, InDesign 1.0 (1999) came out like a lion with rave reviews. Technical glitches and bugs in the program hampered the experience for some and Pre-press providers and printers couldn’t output all those glorious transparencies accurately. Adobe quickly regrouped and came out with subsequent versions, InDesign 1.5 in 2001 and InDesign 2.0 in 2002 (Still not integrated into any Suites yet), gently massaging out all of the product bugs. Adobe also did a good job in listening to its core user base in adding features that drew the attention of long-time Quark users, such as Nested Styles, and true PDF output, somehting Quark still has difficulty with. Finally, in 2003, Adobe introduced the first version of the Creative Suite, updating all of its core programs (after the purchase and migration of Macromedia) into a powerful suite of application programs that are tightly integrated. The end result, clearly a better workflow solution for any designer. Instead of moving back and forth between Photoshop and Quark, InDesign users could actually place native Photoshop files into InDesign, make edits to the original Photoshop file, and then simply update the link. Quark users would have to make extra trips to Photoshop, save out static versions of their files as TIFF or EPS and replace their content. Like the other InDesign releases, InDesign 3.0 offered more and more features that drew more users away from Quark. Now Adobe was gaining momentum. Adobe InDesign User Groups started forming all around the country and industry professionals also began migrating to Quark. Other factors that kept Quark at bay for many users was its price point. InDesign – integrated with at least five other applications in the Creative Suite, was selling for a price that was still less than Quark. Quark 8’s current cost is $799. InDesign is $699, by itself. Educational prices are better for both, but the clear winner in the price category is InDesign. QuarkXTensions also may have a play in whether it stays or goes. XTensions are like InDesign plug-ins that extend the functionality of Quark in terms of what its capabilities are. A lot of pre-press vendors and printers have invested heavily in these extensions, which perform tasks like pagination, output procedures, preflighting, and conversions. It’s another part of their original investment which is hard to part with. Recent rumors and announcements have suggested that Quark will move away from making its desktop software and go to an enterprise server-side solution. Enterprise software isn’t cheap and this product won’t be for the masses. It’s a serious paradigm shift for Quark, one that can only indicate imminent defeat. This in comparison with InDesign CS4, which – comparitively – has a slew of new features like Cross-References, SWF export, Page Transitions, Spread Rotation, etc. Personally, I see Quark winding down as indicated here. I haven’t used it outside of the classroom for any major projects and can’t see why I would ever switch to Quark for a number of reasons. This battle though, kind of reminds of Freehand vs. Illustrator. Depending on which program you used first, you became fiercely attached to it and the separate camps fought openly about feature sets and capabilities. In the end, Adobe killed off Freehand and they’ll probably be able to do the same with Quark.